Recently I became curious about wanting to know how far away from the sea I was at any given time. The United Kingdom is a relatively small country and it is often said that you are never that far from the sea. I decided to write a Python module to find out exactly how far from the coast I was: FLFFC (Find Location Furthest From Coast). The module provides a function that creates a grid of points that is placed over your country of choice. For each point the distance to the sea is calculated and a plot is made of the grid. Below is the plot for the United Kingdom. The script reports that the furthest you can be from the coast in the United Kingdom is ~66 miles (~106 km). Interestingly, there are two local maxima: one north and one south of the line joining the Severn estuary and The Wash. This highlights one of the main uncertainties in this script: when does a river become the sea? Given the large size of some of the rivers and the small size of the country, this distinction will have an impact on the answer. 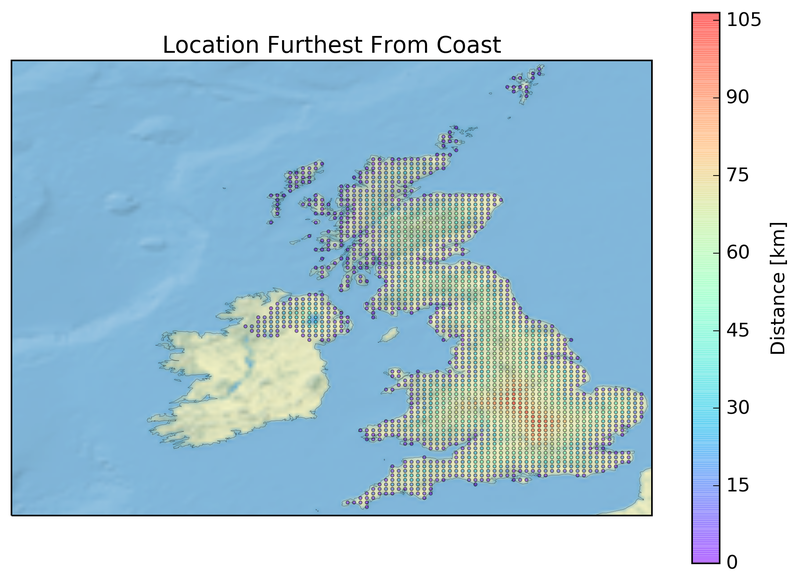 The coastline of the United Kingdom is taken from the 10m-admin-0-countries Dataset at Natural Earth.